Our mission is to strengthen the bonds of comradeship, providing an environment that our members can enjoy a variety of games, advocating for true sportsmanship, and grow to be one of the most respected clans in the SONY Gaming community. We honor all those that bravely served past & present,in the Armed Forces. We respect the individual and show it at all times. We promote fair play and sportsmanship and honor all those that do also. We honor and obey the duties entrusted to us. We stay active both practicing and teaching to improve our skill and teamwork. We are a Band of Brothers, individually strong, but together, as a team, we are greater than our sums. Together we shall fall upon our enemies , merciless and selfless in the pursuit of victory and our Mission; shoulder to shoulder, never leaving a member behind. MEMBERS ARE REQUIRED TO BE 18 YEARS IN AGE TO JOIN. MEMBERS CAUGHT CHEATING(MODDING,HACKING,GLITCHES,LAG SWITCH,ECT) WILL BE REMOVED FROM THE CLAN. WE ARE A CLAN OF HONOR/PRIDE AND BATTLE WITH INTEGRITY. ANY MEMBER CAUGHT USING RACIAL COMMENTS TOWARDS ANY UNIT MEMBER/NON UNIT MEMBER WILL BE REMOVED FROM CLAN. WE ENCOURAGE UNIT MEMBERS TO LOOK FOR UNIT SERVERS AND/OR BATTLE ALONG SIDE OTHER UNIT MEMBERS.THIS DOESN'T MEAN YOU CANNOT JOIN NON-UNIT SERVERS, OR QUIT OUT OF A SERVER BECAUSE YOU END UP ON OPPOSING SIDES OF ANOTHER UNIT MEMBER(S). TROOPS ARE EXPECTED TO HAVE A CHARGED & WORKING MIC FOR CLAN BATTLES...IF YOU DO NOT HAVE ONE LET IT BE KNOWN. YOU WILL NOT BE REMOVED FROM CLAN BECAUSE YOUR WITHOUT;HOWEVER YOU MAY BE EXEMPT FROM PARTICIPATING IN CLAN BATTLES. RUNNING A CLAN/SQUAD TAKES PERSONAL TIME AND A LOT IS REQUIRED.DOING YOUR PART BY COMPLYING TO THESE "SIMPLE" SET PRINCIPLES, WILL ONLY BENEFIT US AS A WHOLE. 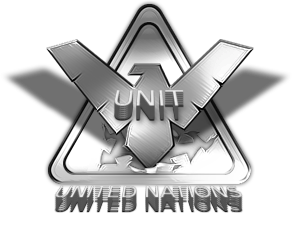 Building a clan has been a daunting task.It took the hard work of many individuals as well as the loyalty and dedication of all those who were brought in.Those seeking the same values which binds UNITED NATIONS [UNIT] together. Anytime you recruit a member,you never know exactly what your going to get.Will they be a long timer or will they tuck their tail and run at the first signs of trouble,or let their egos get the best of them? You need selfless members who are here for the clan.These members know that everyone and their assignments are instrumental in the clans success.That no matter the task assigned,it is up to the individual to perform it to their best ability;and without question. We have run the gamut of types of players who come to our doorstep looking for a place to call home. Some have settled in nicely, while others have left in search of greener pastures.Some we have even shown the door.Through it all we have survived and continue to search for the right members.  UNIT members have built this clan to be one of the most fun and respected clans to be in. The guys and gals have formed a clan in which they/we can all be proud of. A clan free from egos. A clan who understands its the selfless acts of all who contribute that make this clan successful. For that i am content and thankful. I salute each and every member (past or present), who have made UNITED NATIONS [UNIT] a fun and successful clan, both on and off the field. May the trails and tribulations of the past, pave the way for a promising future.